Nigerian police Tuesday night said the country’s deputy senate president was a victim of a burglary attempt and not assassination as he claimed. 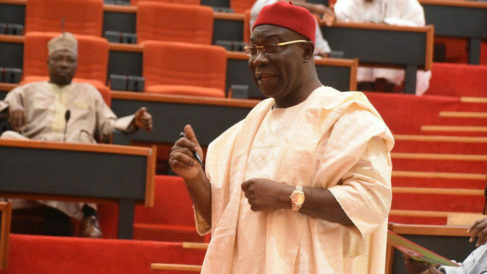 “Preliminary investigation carried out so far did not reveal assassination attempt on the life of the Dep Senate President, Sen. Ike Ekweremadu and his family but a case of Burglary,” Nigeria Police Force tweeted on Tuesday. But the Senator Ike Ekweremadu insisted that there was an attempt to kill him. One of the suspected assassins, he said, was apprehended and handed over to the police. “It was about 4:00 a.m. this morning that some people evaded the security in my house and got all the way to my room where I was sleeping with my wife,” he said. He said the response to his distress call to the inspector-general of police and the deputy inspector-general in charge of operations were poor. “The annoying aspect or the one that is worrisome is that at that point, I called the Inspector General of Police,” Ekweremadu said.